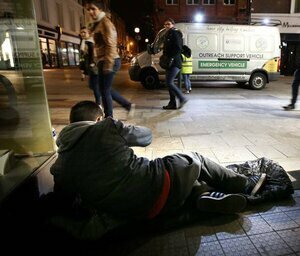 Sinn Féin leader Mary Lou McDonald told Housing Minister Eoghan Murphy that information from the homeless charity Inner City Helping Homeless indicated that there were no emergency beds available for 86 homeless people by 11.30pm on Tuesday night and they subsequently slept rough. Mr Murphy responded by saying “no one will be turned away” from a bed as the cold weather initiative is under way – despite Ms McDonald having just told him that 86 people had slept rough. 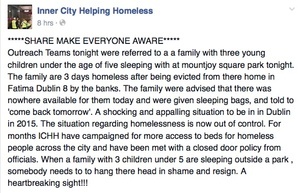 The figure was disputed by Director of the Dublin Region Homeless Executive Eileen Gleeson last night. With the continuous talk of beds for anyone who’s wants them the number of people sleeping rough last night rose. 77 men & 15 women a total of 92 people forced to sleeping in freezing tempatures. 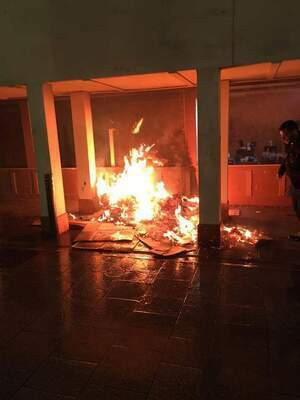 This is completely unacceptable the Minister must today respond! It was cold overnight. Temperatures at some of our weather stations at 6am. Posted in Misc and tagged cold weather initiative, Dublin, Homeless at 12:54 pm on January 31, 2019 by Bodger. it’s to be expected under a blushirt regime, who will focus their efforts on the banks an vulture funds while the people can eat cake..
Cake you say… What kinda cake? Brown Cake? and not everyone likes cake. I’m more of a biscuit kinda guy. today is my last day in this job before i start a new one on monday. we’ll be having cake, i hope. it would be really saying something of my career if i had a leaving biscuit. A buttered Marietta at that….. I needed a good news story after the day I’ve had. Weren’t you in a long term job that you left last year? Wasn’t that you no.. Cool. A thoughtful gift. Time to start bawling crying and embarrass everyone. Providing shelter for all homeless? Because there is room for everyone. Simply because “society” is organized this way doesn’t make it right, try thinking out of the box. Is Anthony Flynn the founder of this charity does anyone know? It’s relatively new. Is this charity fulfilling a role that was not being fulfilled before? I’m not knocking them, I’m just curious as to why there are so many charities involved in the same thing? Why is that? Surely there is overlap there? Listen up kids! Big Mary cares more than the people who happen to be in power! An overfed glutton exploiting a crisis to appear more ethical and scrape off a few easy points in the polls? Please. There are 23 in Dublin; the industry receives somewhere between €100-120m in funding (these are figures are not up to date). There is definitely some duplication somewhere. How much does Anthony pay himself? It’s my understanding that he has never had any other job. I am merely asking questions. If I were to be as simplistic as you dav, life would be easy. ICHH positions itself as being somewhat against the cosy status quo where homeless charities are essentially providers (via outsourcing) of housing services by the state to homeless people. I am not sure how efficient or otherwise these charities are. Dealing with homeless people is incredibly labour intensive. 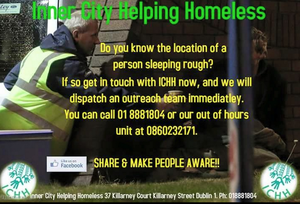 on the radio this morning, a person from the Dublin area homeless service (not the organisation’s right name, I can’t remember it) which is responsible for coordinating the bed availability in the various hostels, shelters etc. 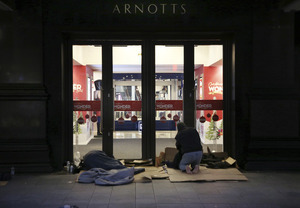 said that there are more than enough beds available to meet demand and that ‘nobody’ needs to sleep outdoors. Was she lying or is that they are not the right type of beds, as in, they are in drug/drink restricted facilities or there is a danger of robbery or violence in the facilities? Exactly. NO matter what you do, there will be people sleeping rough on the streets practically every night of the year for various reasons. They’re not being ‘forced’ to do it, it’s by choice (either directly or indirectly). To round them up and stick them somewhere they don’t want to be would constitute ‘force’, surely? Would it be so difficult to throw up some plaster board sheeting & have individual rooms, for personal safety like. This morning in Stephens Green a 20s something bum with an Aussie accent asked me of I had 80 cent because he was “short on bus fare”. I didn’t think the busses went all the way to Australia. I had change , I told him I had no money and he stormed off. I couldn’t help but think of that dead guy who had a criminal record as long as your arm who spread his AIDs around Australia before charming his way into the Apollo house thing and did that stupid photo shoot to show how people can “wear suits” or something patronizing like that a few years ago. Junkies man! Quite the charmers but once they don’t get their own way…. I can see how non scumbag homeless don’t want to be stuck in doors with them overnight. And you know these thieving scrotes charm there way into these centres to rob other people during the night all the time. Just once Id like a junkie to ask me for money so they can buy some heroin. Id even consider it. All that ” sorry mate…” when you have your earphones in and you stop thinking someone is asking directions?. Just OD already. you must live in a fine bubble! …normally we rely on anecdotes on this story, except when they go against the consensus. I missed the part where starina flatly refused to believe the anecdote. I’ll reread her comment again carefully shall I? well, when the anecdote is received as a “deeply unpleasant comment”, there is reason to assume Starina doesn’t appreciate it. But appreciating something isn’t the same thing as believing it. I don’t necessarily appreciate the sentiment expressed, for example, but I do believe the anecdote. Both apply to the comment. Thanks for the reference too, btw. Just OD already? Ah no need of that now is there. You wouldn’t say that if it was your child or brother or cousin.